Detroit King football celebrates its third state title in four years. The 4-hour bus ride from Muskegon all the way back to Detroit was rough mentally for the Martin Luther King football team, having lost a close one 24-21. They knew they would be able to get revenge, but it would have to come later in the season for all the marbles. Twelve weeks later, the Crusaders found themselves on the winning side of a 41-25 game against the Big Reds and Division 3 state champs. The win was King’s first ever over Muskegon (13-1), fourth football state title in program history, and third state title in four years. King (12-2) senior quarterback Dequan Finn threw for 173 yards on 9-13 passing and four touchdowns. Junior running back Peny Boone had his best game of the year, rushing for 122 yards on 14 carries and one touchdown. Senior wide out Dominick Polidore-Hannah has two receiving touchdowns. The Crusaders’ offense did not touch the ball much offensively, due to Muskegon’s running attack and clock control, but when they did, they made it count. They punted one time on the opening drive. 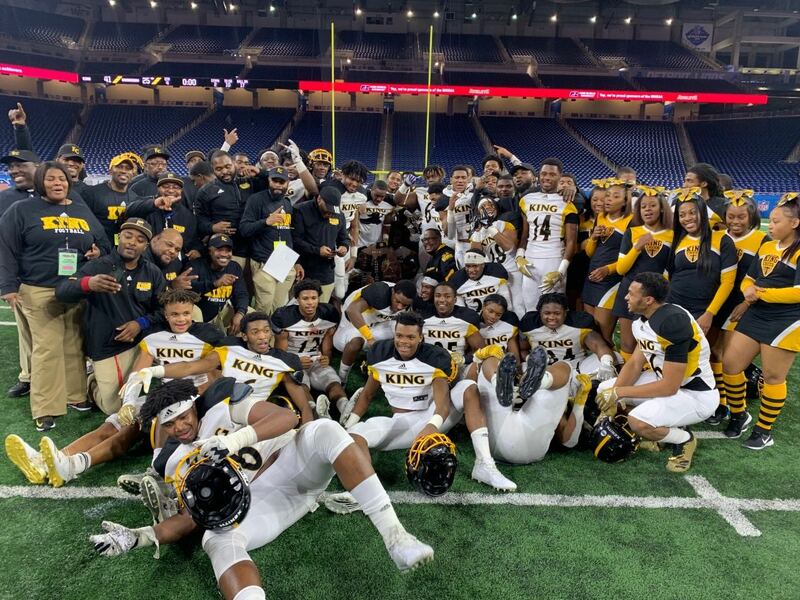 King suffered a 34-point loss to rival Cass Tech in the Detroit Public School League city title game in October. Many wrote King off after that and when they dropped to Division 3, others said they did not have a chance at beating Muskegon again. Five wins later, including a dominating win over the Big Reds and the Crusaders can call themselves champions once again.